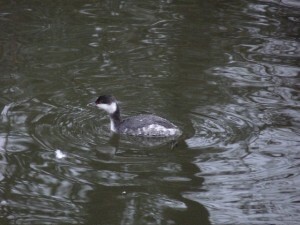 On Saturday 3rd January Nick Croft found a winter-plumaged Slavonian Grebe on Heronry Lake, in Wanstead Park. The bird – which is intermediate in size between Little Grebe and Great Crested Grebe – is still present at the time of writing. It has been diving almost constantly for small fish with, it has to be said, a great deal of success. This bird represents the first record for the ‘local patch’ of Wanstead Park and Wanstead Flats and has helped local patch-listers get the year off to a great start. In a national and European context, Slavonian Grebe is a scarce species. The British Trust for Ornithology puts its UK population at around 30 breeding pairs, while the estimate for Europe is between 4,800 and 8,000 breeding pairs. In the period 2004/5 to 2008/9 the population wintering around British coasts averaged just 1,100. A few birds are known to spend the winter months off the coasts of Essex and Kent and it is likely that this bird was displaced from coastal waters by the stormy conditions between Christmas and New Year. Will it stay? Probably not, but if it does we’re in for a real treat because the breeding plumage is spectacular and gives the birds its North American name, Horned Grebe. Other interesting sightings in the first few days of the year include a probable Woodlark with the Skylark flock on the western part of Wanstead Flats and a Lesser Spotted Woodpecker in St Mary’s churchyard, Overton Drive.